Since 2006, Spoonriver Restaurant in Minneapolis, Minnesota, has been serving up fresh, delicious organic, sustainably sourced food. Long before healthy was cool, owners Brenda Langton and Timothy Kane were committed to bringing the public the healthiest, freshest food options available. Spoonriver Restaurant has special appeal given its downtown location not too far from the Mississippi River. Guests are invited to come dine in a space that is both sleek and inviting. 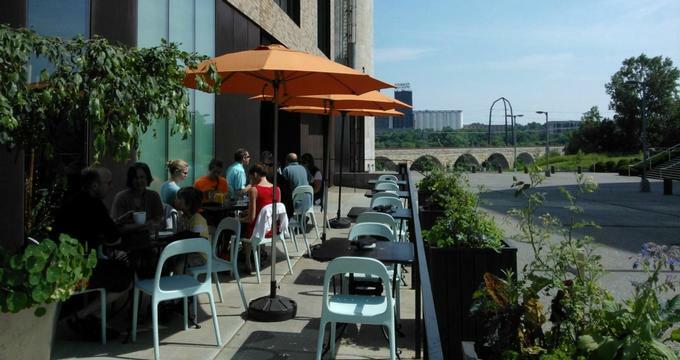 The patio offers beautiful views of the Tyrone Guthrie Theater and the Stone Arch Bridge as well as the Minneapolis skyline. The combination of healthy, responsibly sourced food with an amazing atmosphere is why Spoonriver Restaurant is the place to visit in Minneapolis, Minnesota. Reservations for Spoonriver Restaurant are recommended, especially during busy periods such as the evenings and weekends. Reservations can be made by calling the restaurant directly at 612-436-2236. Spoonriver Restaurant has a menu that features American cuisine made with the freshest whole and organic ingredients. The menu also includes a number of vegetarian as well as vegan options. Some of the menu items are as follows. · Brunch - Charcuterie plate, tofu scramble, buttermilk crepe, French toast, omelets, breakfast quesadillas, quiche, poached eggs, granola and yogurt, scones and coffee cakes, roasted potatoes, veggies, fresh fruit, sandwiches, salads, and burgers. · Lunch - Appetizers: liver pate, soup of the day, salad; entrees: vegetarian or seafood specials, shrimp or black bean quesadillas, Cafe Brenda or Spoon burgers, turkey or mahi mahi sandwich; salads. · Dinner - Appetizers: Spoon dips, grilled steak skewers, chicken liver pate, Brussels sprouts, salad, and quesadillas; entrees: vegetarian, seafood, and grass fed beef specials; okisuki (salmon and tofu), turkey crepe; Salads: Caesar, chicken udon, chicken almond, mock duck udon, Greek; grain of the day. · Beverages - Tea (green, black, herbal), coffee, cappuccino, espresso, latte, chai latte, organic juices, water (spring and sparkling), kombucha. Spoonriver Restaurant offers catering for off-site events. Customers can contact the restaurant directly to obtain additional information regarding the available catering menus and custom menus as well as pricing. Created by the owners of Spoonriver Restaurant in 2006, this farmers market continues the mission of Spoonriver Restaurant by offering whole, organic, quality food options to the public. The farmers market connects local farmers with thousands of Minneapolis residents each week. It is also home to Crepes by Spoonriver, an extension of the Spoonriver Restaurant that serves up delicious crepes with flavored teas and fruit waters. The market runs year round on Saturdays and is located at 704 S 2nd St, Minneapolis, MN 55401. Spoonriver Restaurant gift cards are available for purchase by calling the restaurant directly at 612-436-2236. Gift cards will be distributed in person at the restaurant or mailed off by request.